The Sacramento Sheriff's Department is investigating an apparent murder after a body was found in a south Sacramento County orchard. 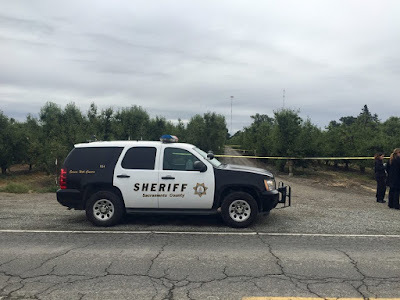 A little after 9:00 a.m. on Thursday, June 8, Sheriff’s Deputies were dispatched to an orchard in the area of Twin Cities Road just east of River Road Communication Center regarding an unresponsive male victim. A worker came across the victim during his morning rounds in the orchard. Sheriff’s deputies responded to the scene and located the male victim who had a gunshot wound to the upper body. Walnut Grove Fire responded and pronounced the victim deceased at the scene. Detectives believe the victim was killed where he was located. There is no known motive or suspect description at this time. No Comment to " South County Murder Under Investigation by Sacramento Sheriff's Department "